Chamare cave, the bat cave (chamare is bat in Nepalese) is located in the Kaski district and is a 10 KMs walk from the famous Mahedev cave towards the west. As the name suggest, this cave is swamped with bats, every point in the day, this ‘U’ shaped cave is a small area where you can see some rare species of the animal. It’s a short walk in the darkness if the bats is all you want to see, but if you wish to go further and take an exit where the cave ends you better have a guide with you for safety. Chamare Gufa or Bat cave has shapes and structures and carvings on the wall of the Hindu deities which are worshiped and followed by the locals. 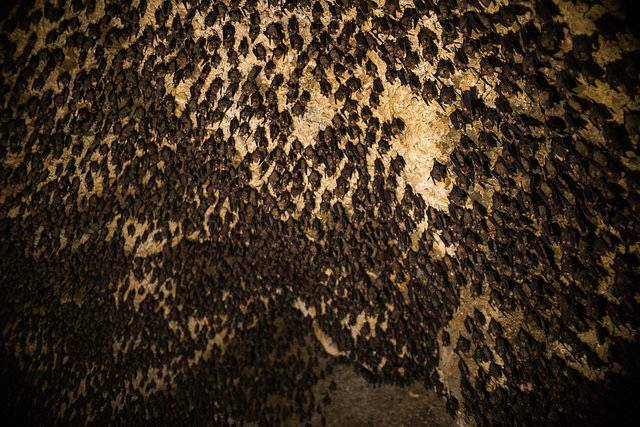 It’s certainly a unique experience, when you stand in the middle of the cave and look up to find the ceiling overflowing with bats, its much like seeing black stars on the stony colored sky. What makes it even more interesting is the cave is their natural habitats that is the most vulnerable and up close experience you can have with creatures like these.